EDIT: Have you given up any hope of the Croxley link being constructed? Also, you spelt Erith as Edith! I couldn't see the Croxley rail link explicitly mentioned in the 2018 Transport Strategy, so I went without it. I might have just failed to spot it, however. Thanks for spotting the Erith typo - that's now corrected! This is an error - many thanks for spotting this! I thought the new West London orbital line ran from Hounslow to Hendon via Brent Cross Thameslink (new station to be built). You've shown it serving Cricklewood and West Hampstead which I thought had been discounted as a route option. I also thought there was supposed to be a station at Dudding Hill - is that what you've shown as Neasden? I am surprised you've shown the Bakerloo Line as reach Hayes and Beckenham Junction. I thought those had basically been abandoned for now with the line running no further than Lewisham? The first stage of the Bakerloo extension is certainly to Lewisham only, but phase 2 by 2040 doesn't seem impossible. I didn't know which was more likely, so I (completely arbitrarily) picked the route which involved another interchange with LU, since it made for a slightly more interesting map. I'm not sure if these proposed stations are in the transport plan but do you think Renwick Road (between Barking Riverside and Barking, maybe interchanging with C2C) and Bricklayers Arms (between Elephant & Castle and Burgess Park on the Bakerloo Line Extension) should be added? They are extra stations brought about through consultations with the public. Actually another error is that the National Rail symbol at Elmers End should be removed as from what I understood, the Bakerloo line will not be sharing with National Rail but absorbing the lines. Thank you - I've corrected this! It's tricky. I've gone for only trying to include routes / stations that are in the March strategy to try and have as objective a criterion as possible (although even then it's not perfect, given that the document can be vague or give alternative options), and also to avoid the map looking too much like the 2050 Tube Map that was made a few years ago - so I'd lean towards leaving these two out. But it's very tough, and there are other proposals which I'm on the fence about including - like Crossrail 2 to Hackney or a DLR/Overground extension to Thamesmead. Good point! I'd (mistakenly) thought that the NR services from Hayes that don't go via Lewisham would still run - it looks like they wouldn't. I'd (mistakenly) thought that the NR services from Hayes that don't go via Lewisham would still run - it looks like they wouldn't. 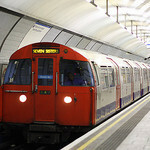 Although the other end of the Bakerloo has grandfather rights to mix Tube-sized and NR trains on the same tracks, it is most unlkely the practice would be allowed to be extended to any further lines! Some fun news! The Tube map made it into Londonist and the Evening Standard. On the evening standard article, one of the captions for a picture of the NLE state "a possible extension to Battersea" as if the tunnels haven't already been dug out. It's a good map and deserves recognition. It looks better than TFL's try to put crossrail on the map at least. Looks nice! Intrigued to know how you drew it though? On the evening standard article, one of the captions for a picture of the NLE state "a possible extension to Battersea" as if the tunnels haven't already been dug out. I noticed that! Tons of people don't even know about Crossrail - I guess a useful impact of making these kinds of maps would be to raise awareness about them. I drew the maps using Inkscape. It's very easy to use - I'd never used Inkscape at all until I tried making Tube maps with it. The trickiest part is doing the curves which join the line segments up, especially around the Circle line where you have multiple curves that need to fit around each other.